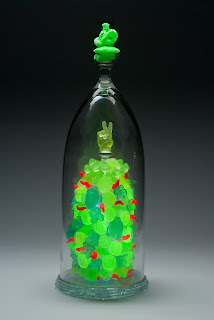 >Tim Tate has a big show coming up at SOFA Chicago – (opening next week at Navy Pier – in Maurine Littleton Gallery – Space 720) He will be unveiling his newest works that continue integration of new media – his cast & blown glass features LED technology, sometimes with the LEDs in the blacklight range, illuminating uranium glass . 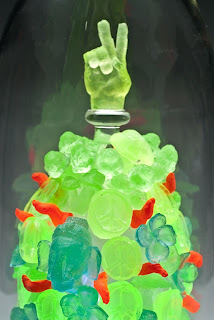 The work is made with cast glass peace symbols, flowers, Ganesh heads, toadstools and more. The top finial is a cast glass hookah smoking caterpiller. The piece is lighted internally with black light LED’s. This gives the cast pieces a truly wonderful inner black light glow. This represents a wonderful departure from his well known video/camera series. There is an early offering of the piece – an online auction of the work as a kind of early advance preview – Click HERE to jump to the special Ebay listing of the art. Tim’s series of internally lit works are titled “Illuminaria”. Click here to see other works of Tim @ Maurine Littleton Gallery. Artist Erwin Timmers is working on a new series – where he plans on casting footprints in glass. To achieve a negative in which he will cast a positive image, he had made a clay ‘original footprint’ . Mixing up clay in a cement mixing trough, Erwin began his foot stomping. Later, Professor Tate joins in the hijinx . 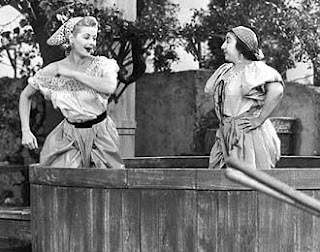 It became very I Love Lucy – in fact…. Dave D’Orio puffs out a piece gaffered by Michael Showalter. Kate Pick oversees her work. 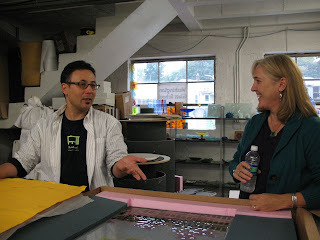 The BE roll-up class was so much fun – another day was scheduled – it has become an addiction! The artists investigated more complex fused and blown shapes and forms. Thanks to Mike Showalter and Dave D’Orio over at DC GlassWorks . Michael Janis’ sgraffitto piece blown out. >Besides being the Guru of Green, Erwin Timmers manages the kiln maintenance at the glass school. After a kiln disaster, Erwin moved the damaged kiln outside and proceeds to grind down the bottom of the kiln. The bright side is that he is all set for Halloween! Red is so his color. The BlackRock Center for the Arts gallery is a fantastic showplace consisting of 1500 square feet of exquisite gallery space. With its high white walls and beautiful windows strategically placed, this gorgeous gallery allows in just the right amount of natural light. Black Rock is located at 12901 Town Commons Drive Germantown, MD in upper Montgomery County, about 20 minutes from the Capital Beltway (495). They currently have a Call to Artists and the call is open to all artists residing in Maryland, Virginia, and Washington, DC over the age of 18. Artwork shown is original artwork only. All work must be ready for sale and to be presented in a professional manner to the public at the time of delivery. This call will cover exhibits in the gallery from September 2010 through August 2011. An exhibit may include one applicant or a combination of applicants, based on the judgment of jurors (i.e., 1 or 2 wall artists may be combined with a pedestal artist). A jury will select the artists and create eight exhibits to be included in the exhibit year. The jury panel is comprised of and gallerist Elyse Harrison, Jodi Walsh, and Lenny Campello. 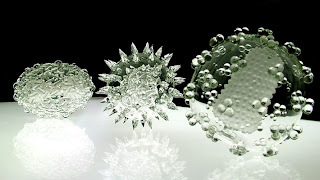 Multidisciplinary UK artist Luke Jerram worked in collaboration with glassblowers Kim George, Brian Jones and Norman Veitch to create a stunning series of glass virus sculptures. Created over a period of 5 years in consultation with virologists from the University of Bristol, the transparent glass sculptures were created to contemplate the global impact of each disease and to consider how the artificial colouring of scientific imagery affects our understanding of phenomena. 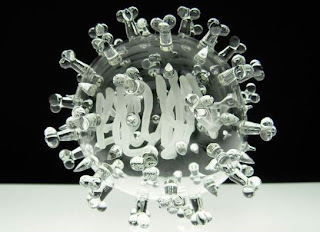 For more information on Luke Jerram and his work & slide show of other microbes and virus sculptures, click HERE. >Studio Artist Sean Hennessey is shown here working on his series of cast glass and concrete panels. Sean measures his glass and sketches his compositions. Sean makes his panels using the dry plaster casting method, from float glass. He then renders the surface with other materials such as oxidized concrete and acid stains. Sean’s glass and steel panels were one of the hits of the recent Artomatic. 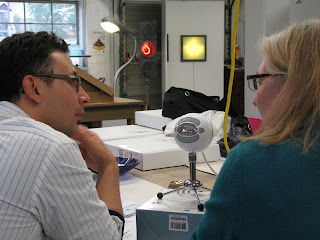 The dry plaster technique that Sean uses is taught in the Washington Glass School class #928 – Bas Relief in Glass (taught by our Nicole Puzan). This class is starting soon – check it out! Click HERE to jump to the class schedule. The McLean Project for the Arts currently has an exhibition of narrative artwork by Allegra Marquart, Michael Janis and Tom Baker in a show titled “To Tell the Tale” thru November 7th. The MPA website features a podcast interview conducted by Nancy Sausser. Click HERE to jump to the MPA podcast. Kilncast glass got the blown glass treatment in the roll-up class this past weekend. The class explored the innovative glass working method often referred to as “the Australian Roll-Up” – a technique that allows the artist to blow 3-dimensional forms without the necessity of a furnace and allows for an extended time for focused design of the patterning, as compared to the faster pace required for traditional hot glass. This class combined working on both the Washington Glass School and at DC GlassWorks allowing for a fun cross-pollination of ideas and techniques. Mike Showalter shapes while Nancy gives a bench blow. The Glass School Gets A Wax Job! The Washington Glass School held its Painting With Wax: Encaustic Weekend Workshop this past week. Artist Ellyn Weiss taught a great workshop where the students learned to paint and collage with wax. Working with color and wax. The class participates in the critique of the finished artwork. The students created several masterpieces over the two day course.